As winter temperatures set in, hot meals for Atlanta’s neediest seniors are often out of reach. Hunger-fight start-up Goodr continued their innovative pop-up approach to food distribution logistics by partnering with food giant Hormel Foods on November 28, 2018, for a free pop-up grocery store featuring staple Dinty Moore stew. Serving up hot bowls of Dinty Moorestew, Kroger biscuits and fresh produce added Southern hospitality to more basic food distribution. While hunger across America is a growing and pervasive problem, Goodr looks at the issue from a more logistical standpoint. They found that businesses and corporations had enough surplus food to help find a hunger solution; the issue wasn’t getting enough food, it was getting the food to people in need. Atlanta’s neediest elderly residents were often unable to travel to food banks or distribution centers because they didn’t drive or had no nearby neighborhood grocery stores. Goodr looked at finding ways to get surplus food distributed to needy populations. By focusing on corporate surplus foods, logistics and lowering food waste; Goodr has been able to serve nearly 1,000,000 needy Atlanta residents in 2018 with their unique pop-up grocery and meal events. 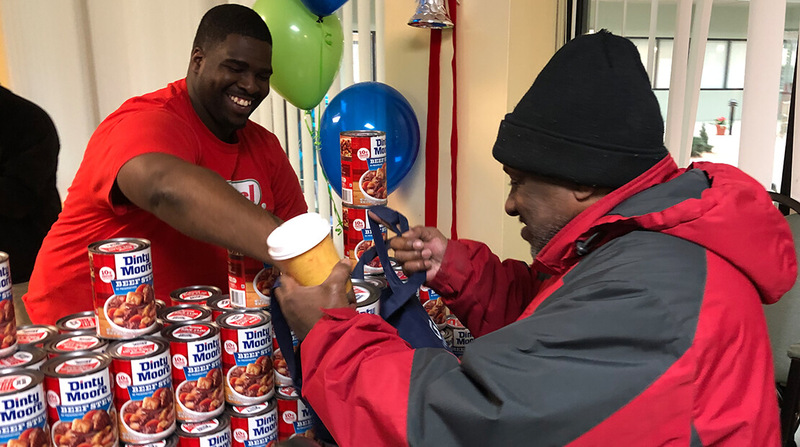 “It’s so humbling to know Hormel is joining forces with us to serve seniors experiencing food insecurity here in Atlanta. For an Atlanta based company, this kind of support is necessary– the fight against hunger cannot be won alone. I’m happy Hormel is fighting the good fight with us.” – Jasmine Crowe, CEO, Goodr. The Dinty Moore partnership wasn’t Goodr’s first pop-up event in the Atlanta area. Goodr pop-up grocery stores are set up regularly in senior centers and YMCAs in the Atlanta area through partnerships with the United Way, Westside Future Fund, Atlanta Housing Authority and JenCare. Their Neighborhood Eats Program teams local chefs with nonprofits to repurpose surplus meals for communities and after-school programming. The Hormel partnership was the first time the industry-leading food tech start-up partnered with a national consumer products food brand.